Ortiz became one of baseball’s most feared sluggers after being released by the Twins and joining Boston in 2003. Had a monster year in 2004 to help lead Boston to the playoffs. He then proceeded to hit five more round trippers and drive in 19 more runs during an incredible 2004 post season performance that saw him average .400 in the 14 games he appeared. “Big Papi” hit a career-best 54 home runs in 2006 and his phenomenal 1.066 OPS in 2007 led the Red Sox to their second World Championship in four seasons. It had been sort of downhill since for the big Dominican and then rumors of steroid use surfaced and probably put a tarnish on his career achievements. 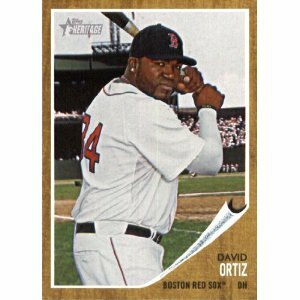 Ortiz put that all behind him in 2011 however, as he once again got his regular season average over .300 and won his fifth Silver Slugger award as the top-hitting AL DH. He also happens to be one of the great “Yankee killers” of all time. Ortiz is currently a free agent. If Boston hadn’t imploded at the end of the 2011 season, I’m betting this guy would have already signed a new contract with the Red Sox. Now, with all the changes that have taken place in the team’s front office, Boston fans have to wonder if Ortiz will still be wearing the Red Sox uniform in April.